Qui se cache derrière BartenderOne Montréal? Cette série d’article est destinée à vous informer sur les membres de l’équipe de BartenderOne Montreal. Cette semaine, rencontrez votre instructeur Luke Martin. 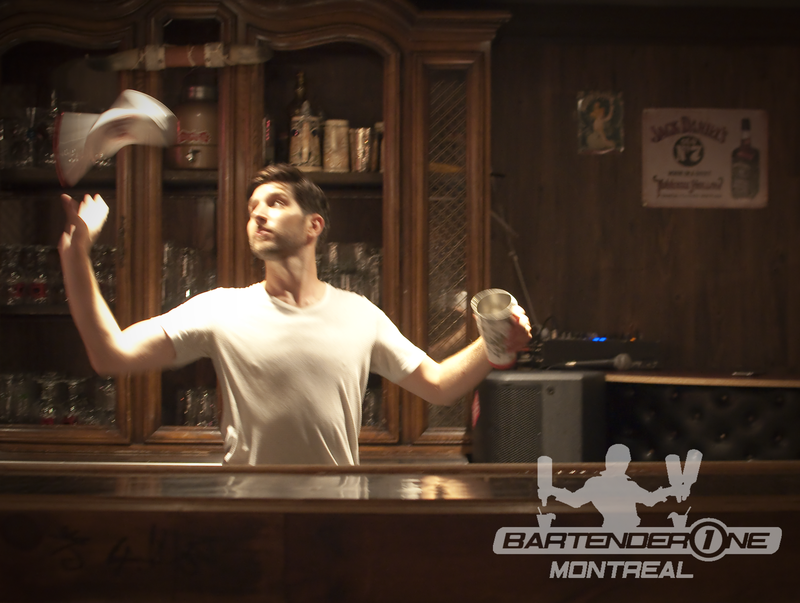 Luke est venu de loin pour atterrir chez BartenderOne. Né à Columbia en Caroline du Sud, il a grandi entre le Québec et l’Ontario pour enfin mettre les pieds à Montréal en 2011. Malgré ses études en arts de la scène et en psychologie, il a complètement changé de cap pour se lancer dans l’industrie du bar. Après son premier emploi au HB où il a touché à la culture cocktail pour la première fois, il est entré au B1 et est vite devenu un grand bartender. C’est cette année qu’il a participé à sa première compétition de bartending, le Made With Love, et il prévoit répéter l’expérience dans le futur. Il est désormais bartender chez Appartment 200 et Atame, et gérant et instructeur chez B1 Montréal. Il aime le côté anti routine du bar et continue à en apprendre tous les jours sur cet art qu’est le bartending. Demandez lui un Whiskey Sour et vous ne serez pas déçus ! 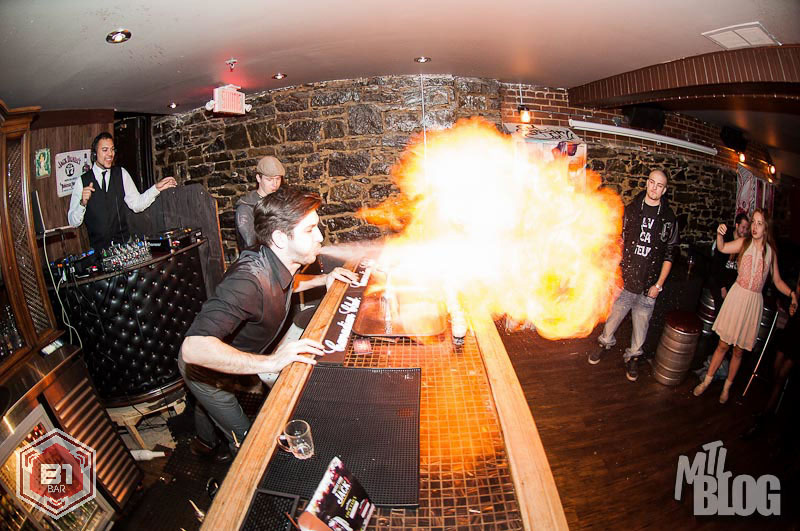 Who’s hiding behind Montreal’s BartenderOne? Get to know our team through this series of articles. This week, meet your instructor Luke Martin. Luke has come a long way to land at BartenderOne Montreal. Born in Columbia, South Carolina, he was raised between Ontario and Quebec to finally arrive in Montreal in 2011. Regardless of his background in acting and psychology, he entered the bar industry and became a bartender. After his first job at HB where he first learned about cocktail culture, he got hired at B1 and quickly became a great bartender. 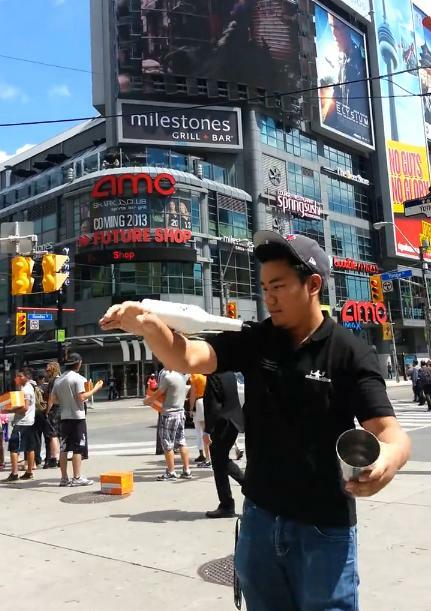 He participated in his first bartending competition, Made With Love, last month and plans to repeat the experience in the future. He is now a bartender at Appartment 200 and Atame, and manager and instructor at B1. He likes the anti routine of the bar and continues to learn about the art of bartending everyday. Ask him for a Whiskey Sour and you won’t be disappointed! An ABC show airing tomorrow (10 p.m. ET) at ABC is bringing up a very relevant subject for all of us in the industry: The ways some bartenders and bar owners rip off their guests. “In the bar business, sometimes people are losing so much money. They can be losing $10,000 to $20,000 a month. Their house is on the line. They get desperate,” he said. Among the tricks bartenders use to cheat customers according to Taffer are pouring less than the full amount of liquor charged for, watering down drinks and even secretly giving a cheaper brand than the one ordered when the guest cannot tell the difference between top-shelf vodka and the cheap stuff. Sometimes bartenders will pour cheap liquor into an empty premium bottle, Taffer said, or they’ll add water to a half-finished top-shelf brand. It could be the bartender doing the switcheroo on his own, or the owner telling the bartender to be dishonest, or both, Taffer said. In the end, those who do it do so to try to make more money off each drink. Crushed ice, meaning the ice that comes out of those large bins behind the bar, means less liquor, Taffer said, while cubed ice allows for more space for liquor and is a better deal. But a half jigger of booze poured over crushed ice appears to look like more booze than a full jigger poured over cubed ice, he said. Don’t be impressed if your bartender can pour a drink a foot away from the glass, Taffer said. He is just cheating you out of booze by creating an illusion. When a bartender holds the bottle over your glass for a long time, he is obviously giving you something extra, right? Wrong, says Taffer, but you’ll tip him as if he did. That little red straw is the key to fooling you into thinking that weak drink the bartender just gave you tastes strong because, Taffer said, unscrupulous bartenders will keep those straws in a glass of vodka hidden under the bar. The only thing the bartender can’t tamper with in a bar, Taffer said, is bottled beer. A new film about bartending? It was about time! Since 1988 when Tom Cruise took flair bartending to the masses with “Cocktail” – a movie which many bartenders in the industry openly dislike- the interest in the noble art of pouring a drink has been virtually back in the shadows. That is why, it is always good when you find another film that brings back the life of a bartender to the big screens. 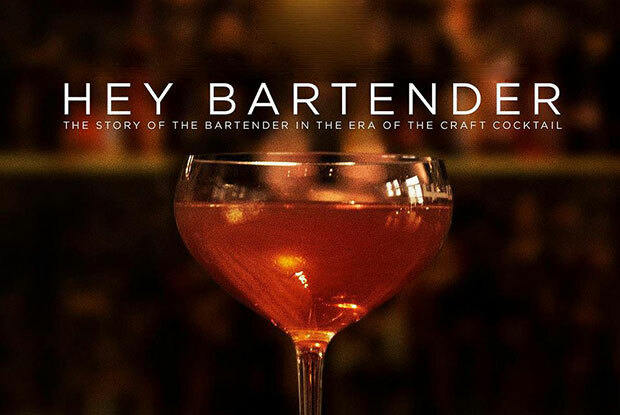 This being said, it was a pleasant surprise to find “Hey Bartender; The story of the bartender in the era of the crafted cocktail” produced this year and which even more surprisingly is good! This documentary focuses on the lives of two bartenders trying to achieve their dreams through bartending. The first, an injured Marine who turns his goals to super star bartender at the best cocktail bar in the world. The other, a former bank executive who leaves his white-collar job to buy the corner bar in his hometown years later he struggles to keep afloat. The bar is three deep and the bartenders are in the weeds at the greatest cocktail party since before Prohibition. Hey Bartender is the story of the rebirth of the bartender and the comeback of the cocktail. Featuring the world’s most renowned bartenders and access to the most exclusive bars in New York with commentary from Graydon Carter, Danny Meyer and Amy Sacco. For all of you know -it- alls out there, this documentary may not be the kind of absolutely real film you are waiting for, but one of the features that adds points to this film is that despite the fact of being backed by a major distillery it is not the propaganda, advertising tool you could expect. 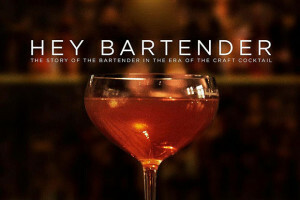 Posted in Uncategorized | Comments Off on A new film about bartending? It was about time! What is the most effective way to get a bartender’s attention in a crowded bar? Going to your favorite bar or club is as you may already know, one challenge after the other. Choosing the rights clothes, handling the logistics to get there, going through the bouncer’s filter. But probably, the biggest challenge is when you get to the bar and you are competing with another 50 thirsty throats for the bartender’s attention. Looking at the bartender was successful in 86% of the orders. Leaning on the bar happened infrequently but also seemed to high a high strike rate when it did happen. The findings were used to produce an update to the robotic bartender’s programming to allow it to ask customers if they would like a drink when they display the right body language. The researchers also, isolated a few tactics that definitely DO NOT WORK. These included squeezing in between other customers (you might end up waiting even longer), leaning on the bar, looking at a menu or the drinks available, or looking at money. The study also reported that waving money is a surefire way of not getting served. What you think of this research, do you think there is any other tactic they missed? Share the secret and help your fellow partygoers get their alcohol faster. 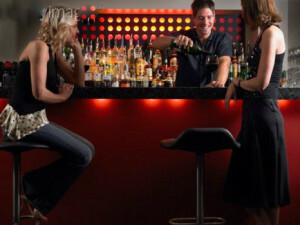 Posted in Uncategorized | Comments Off on What is the most effective way to get a bartender’s attention in a crowded bar? A couple days ago we mentioned the story about a bartender who responded to a drunk guest throwing his face on her face to stabbing his hand Hannibal Lecter style. Today we have a somewhat similar case – with much less blood – regarding a short tempered bartender and a card with no funds in the city of Dayton, Ohio. “A West Milton woman’s recent request to run a bar tab set in motion a bizarre set of events at a local bar that could not possibly have been the best use of two officers’ time. The bartender decided to charge the woman’s debit card instead of holding it for the tab she requested, according to a police report. The 23-year-old’s debit card was declined for insufficient funds. Things spiraled out of control from there, as they often do in these situations. The bartender told the woman her card was “no good” and accused her of trying to scam him, the report says. She told the bartender that the card was her only means of getting her paycheck to be deposited at midnight. Not buying it, the bartender broke the card in half and threw the pieces in the woman’s face. A short time later, the woman called police and her bank. She learned her paycheck had been deposited in to her account after all. Officers interviewed the woman and the bartender. The bartender said he decided to charge the woman’s $9 drink to her card when he realized she was paying with a debit card and not a credit card. We know that this industry is harsh and it implies dealing with a ton of cheap drunks trying to scam you, but do you consider this bartender’s actions were justified? A few weeks ago we shared a very popular article listing the 10 reasons to date a bartender. Now, to be fair, we are reproducing a very good reply to this originally mentioned in the Huffington Post. Here are the 15 reasons NOT TO DATE a Bartender. Check it out and let us know your opinion. 1: You will not see them. When you do they will look like they are a) hungover and b) exhausted. This is because they are a) hungover and b) exhausted. 2: Whenever you visit a bar together, no matter how stunning you look, their first glance will always be at the spirit selection. If the bar has a poor spirit selection, they will be depressed and listless for the rest of your evening. 3: Unless you are willing to learn something about aged rum and the subtle nuances of various bitters, they will resent you. 4: No matter how super-smart they actually are, all your friends will think they have less than three GCSE’s to their name and almost certainly in humanities subjects like drama and home economics. 6: On a sunny day, when you wish to frolic in the park, they will be hidden in a sweaty pit of duvet moaning in pain at the sunshine creeping through the window like the vampires of old. 7: Face facts, your mother is not going to be pleased. 8: Every holiday you take together will have a hidden alcohol theme. You may visit Cuba (Havana Club), Guatemala (Ron Zacapa), and France (Hennessy Silver Jubilee 1977) but you will never visit Egypt, (makes nothing) Cambodia (less than nothing), and Puerto Rico (Bacardi). 10: In fashion, both on shift and off, they will lean toward wearing more black than Johnny Cash at the height of his career (1960-1963) and only marginally less than a Hasidic Rabbi. 11: Their natural musk will be the faintly perceptible smell of Jagermeister. 12: Years of inbuilt cynicism from dealing with the general public means they will believe in no faith, creed or deity but will fly into an uncontrolled state of rapture at the mention of the name Dale Degroff. 13: Their sexual performance will be limited by a bad back caused by years of picking up heavy objects with poor lifting technique. Plus who knows what effect years of living off pizza, KFC, the bar’s complimentary peanuts and dubiously coloured staff meals has had on their sperm count. 14: Your chances of getting on the property ladder are slim, as the pay is so bad it will take you approximately 1,253 years to get a down-payment together, and then only on a one-bedroom flat in Croydon, Loughton or Dagenham, which will never be cool or trendy. 15: They will judge all your friends harshly when they order a mojito. 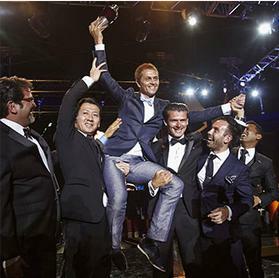 The Diageo Reserve World Class Bartender of the Year has earned a reputation as the most prestigious bartending competition in the world with the finest bartenders from every nation displaying their top creations to earn the glory. This year 43 finalists were followed by camera crews as they competed on board a luxury cruise liner sailing from Monaco to St Tropez, Ibiza to Barcelona, in July this year. “World Class showcases why fine drinking and cocktail culture sets trends from New York to Shanghai,” said Dominic Redfearn, global media and content director for Diageo. The programme, produced by Shine North, is scheduled to air in 110 countries across the world on channels including Primetime, RTL 5, MTV, the Travel Channel, and the Food Network. Alex Connock, managing director of Shine North, said: “The global appreciation of mixology coupled with the truly international line-up of talented, inventive bartenders makes for a compelling show with universal appeal. Throughout the competition, bartenders were tested on their spirits knowledge, food pairing abilities, speed, and signature serves. This July, the Spanish bartender David Rios, of Jigger Cocktail & Disco Bar was crowned Diageo World Class Bartender of The Year. Police in Philadelphia are reporting an enraged bartender who turned the table on two of her patrons after one of them threw a drink in her face overnight, stabbing one customer and slashing another person in the arm. Apparently the fight began when a patron threw a drink onto the unidentified woman behind the bar, the upset bartender then allegedly grabbed a knife and stabbed the drink thrower in the hand, police said. Both victims were taken to the Hospital in stable condition. You can bet this lady makes a great Bloody Mary! !